Hi Guys, all we know very well about the YouTube. YouTube provide the facility watch and download any online video, movies as well as you can also upload and share any video on YouTube channel. Lot of person like to watch different kind of videos or movies on YouTube during spending his free time. YouTube video is playing when your screen is not switched off but when your smartphone screen is switched off, playing video is stopped. Next time when you turn on your smartphone screen, you must have to tap on the play button. Today we discuss how to continue playing YouTube videos when screen switched off. If someone want to play any video then he must tap on the play button on the YouTube. But as soon as your smartphone screen is switched off your playing video is stopped. Next time when you turn on smartphone screen you have to tap on play button again to start playing the video or movie. Most of the person want to know the solution how to continue playing YouTube videos when screen switched off. You must read this article, and you will get proper solution of your problem. Step 1: Download and install Mozilla Firefox browser app on your smartphone. You can easily download Mozilla Firefox app for your smartphone by clicking on this link. Step 2: After successful install Mozilla Firefox browser app, active the YouTube page with the help of this browser. Step 3: Tap on the three dot button which is placed on the top right corner and turn on “Request Desktop Site” check box. Step 4: Now, tap on any required video or movie which you want to watch. This video will continue to play when you switched off the screen. I hope you like this article. There are lot of person around the world who daily watch videos on YouTube. 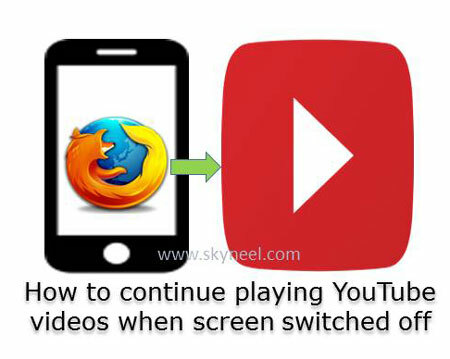 After reading this article you will be able to know how to continue playing YouTube videos when screen switched off. Kindly share your knowledge and this article with others to help them and give your important suggestions in the comment box. Thanks to all.